As a compliment to our newsletter, I enjoy sharing some of my additional thoughts about how to maximize a particular situation. In our little neck of the woods (and also several other parts of the country), we are in the midst of heat waves that will keep you, your family and pets hugging the A/C vents all day long! With the reality that outdoor playtime may be limited, I'd like to share a few ideas of how you, your family and Side Kicks can enjoy quality time together while maximizing your dog's potential. Please keep in mind that every dog is different and you should always consult with your vet about what an appropriate level of activity is for each dog. In other words, not all dogs should be swimming the English Channel or alternatively, lounging around eating frozen treats. Your goal is to try and strike a healthy balance and perhaps even a nice combination of these activities. One of our favorite ways to remember all of the fun options to try during Summer is to create a family checklist on a chalkboard and as we accomplish a task, we add a check mark. Plus, this is a great way for you to grade your pup's interest level - maybe indoor agility doesn't satisfy your dog's yearning to run a large agility field or perhaps, they adore hide-and-go seek! You'll never know until you try and your pup will be a great pal all the way! If you are watching TV, take a moment to massage, stretch and comb your dog. They will appreciate your gentle ways and feel more relaxed from hot exercise. While you are working at home, offer your dog an interactive toy and/or puzzle to stimulate their mind and teach them to focus on a sequence of actions independently to encourage extended positive and productive behaviors. During a break between your own activities, teach your dog a new complex trick! 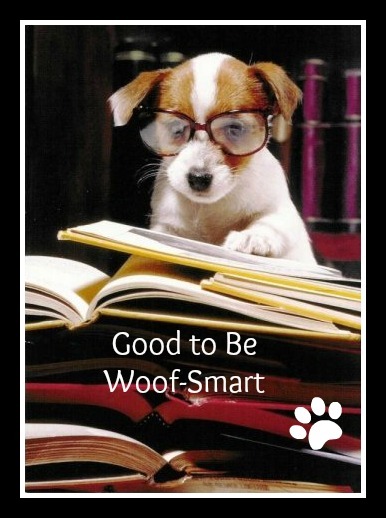 With a few steps, they will be learning, wagging, practicing and eager to perform their new abilities! Put together your own indoor agility course. This can be as simple or complex as you choose! For starters, teach your dog to jump through a hula hoop, jump over a level broom or walk up and down a small plank ramp. Within minutes, your dog will be exercising, learning and having a blast! If you choose to venture outdoors during the daytime, keep things cool! Play in the sprinkler with your kids and dogs - this is a crowd-pleaser! Try your hand at making dog pupsicles! Freeze dog-friendly fruits, vegetables, toys and treats in a block of ice and let them work to get the bounty! Just be sure that your dog has plenty of shade and a cool mat on which to lay. Always ensure there is an indoor option to return if the temperatures become to high! Contact your local hardware store and find out if they offer any classes to build a dog house or dog "cabana" as they are often called. When their human family members choose to enjoy a short while outside, it is safest for dogs to have a shaded and cool place to relax! Try Doga or Yoga with your Dog! Doga has all the same benefits of yoga: increased flexibility, strength, energy and endurance. The only difference, of course, is that you're sharing the mat with your pooch. During this ancient exercise with a modern twist, expect to help position your pet into poses as well as do your own. In some classes, owners also perform massage and reflexology on their dogs, adding to the overall calming effect. Hide-And-Go Seek? An almost endless amount of fun but still challenging, indoor games exist for you and your pooch to play together. Of course, you'll want to select a game that not only interests you but your dog, too. His breed or mix most likely holds a clue to what type of diversion will pique his curiosity and hold his interest. Retrievers, for example, like to fetch whereas most hounds love to use their noses, so games involving these types of activities are a good choice. You can also check out great books like this one! Dog Dancing - can you piece all of your pup's tricks together and choreograph them to music? Here's a lovely sampling of where practice can lead a dog and loving owner!